i know flying is so commonplace, and i was a little disappointed in myself that i started feeling so normal after the first 5 minutes, but it really was pretty fantastic...sitting up in the clouds, drinking ginger ale and thinking joni mitchell was sitting in coach 3 rows up (she was not). i'm feeling pretty lucky this morning. enough so that it's 6 o'clock in the morning here in l.a and i'm wide awake. oh dear. happy monday, friends! and thank you all so much for the wonderful list of things to try and see! i'm beyond excited to be here. but ache for my boys the most. if you're in ohio, go check in on them for me...i blow a kiss their direction. My husband and I had our first vacation away from our daughter in the spring. Enjoy every second of your time, and have a wonderful trip! Sounds amazing, I hope your trip goes great(: And I am exactly like you. Every time I go on a plane I become excited at take off, but after a while it becomes "old". Hahaha. oh gosh, I've done so much flying that I really hate it! I do love California though! Have fun! Beautiful pictures. Can't wait to hear more about the trip! enjoy this special girl time. i just got some myself and it was exactly what i needed. even though you miss the boys think how refreshed you'll feel! welcome to LA! I am always disappointed flying home to LA, because it seems that every time I fly somewhere out of state I see lush green lands outside the airplane window. Then flying into LA it's just smoggy and brown and gross. But it's home I guess <3 Hope you enjoy your stay! 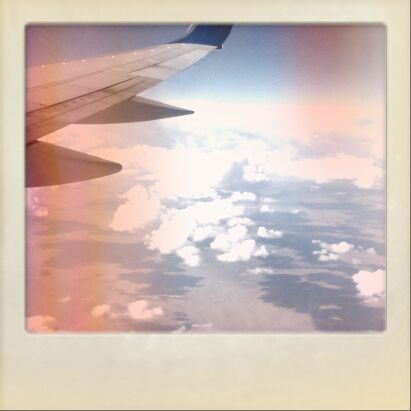 window seats are the best... and flying over the grand canyon is always pretty amazing. have such a good time! but most importantly dip your feet in the sand and ENJOY! It seems as if you brought this wonderful cool fall weather with you! Have fun here! hooray! welcome! you're going to be just fine, a little separation can do wonders for appreciating what you have back home! ah, dear cali. have a beautiful time, my girl. ps i am one of the strange few who LOVE flying. the whole thing feels like a miracle to me, every time. have a fun trip! i live in san diego, it's wonderful. you should take a trip down south for a day. you would love it here. love your blog!! your life is so sweet. if you're in downtown LA check out the Biltmore Hotel (Millennium Biltmore) on S Grand Ave between W 5th St and W 6th St across from Pershing Square. it's a historical landmark, the most beautiful hotel ever, and it's also the place i got married. they've also filmed countless films and tv shows there including Mad Men. you can just walk around and take photos if you like, they're very friendly there. if anything talk to Valerie, the hotel manager and tell her Andrea Carpenter-Heffernan sent you. down the street from it is Babycakes (130 West 6th St) where you can find the most delicious vegan/gluten free treats around. there's also Louis (700 South Grand Ave) for the non-vegans which is also a pretty fancy bar. another of my favorites is The Edison (108 W 2nd St). it's a fancy bar that's kinda like a 1920's speakeasy with amazing food, delicious drinks and burlesque on some nights. i spent my bachelorette party there, my one year anniversary and probably my next birthday there. you have to dress nice and get there early, the entrance is in the alley (sounds scary but it's not). it's perfect for a girl's night out.